We have all the required hours needed to renew any real estate license in the state of New York built into one easy to use package. All of our courses can be completed At Your Pace online in order to help you maintain your license. Once you finish your class you will have an official certificate of completion available and we will report your course completion to the NY Department of State for you automatically. 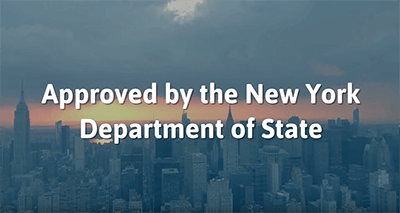 We are approved by New York State to offer online CE. Licensees are required to obtain 22.5 hours of continuing education to renew their license. 1 Hour is required to be on Agency (2 Hours for your First Renewal). 3 Hours have to be on the topic of Fair Housing. The remaining 18.5 Hours are required to be on approved electives. This 22.5 hour core course will fulfill all of your continuing education requirements to renew your New York Real Estate License every 2 years. This course includes 2 hours of Agency and the required 3 hours of Fair Housing, in addition to the topics of Brokerage, Real Estate Law and Real Estate Finance.